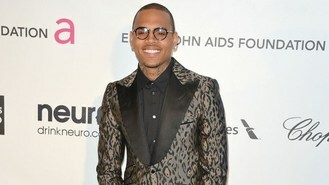 Chris Brown has revealed that he is planning to stop making music, with his next album being his last. The 24-year-old hinted that he is fed up with his personal life taking the main focus away from his music, which stemmed from his assault of ex-girlfriend Rihanna in 2009. "Don't worry mainstream America. After this X album, it'll probably be my last album," he tweeted. He added: "Being famous is amazing when it's for ur music and talent. I'm tired of being famous for a mistake I made when I was 18. I'm cool & over it!" Chris has had a tumultuous music career since he was convicted for attacking Rihanna, with his third album Graffiti receiving mostly negative reviews from critics although it was nominated for two Grammy awards. His fourth album FAME topped the Billboard charts in the US and won him his first Grammy, and his fifth album Fortune, which was released in 2012, also debuted at number one in the States. The rapper has reportedly had feuds with fellow rapper Drake and Frank Ocean, and his relationships with Rihanna and Karrueche Tran continue to make headlines. His sixth album X is due to be released later this year. Miley Cyrus has announced that her new album will be called BANGERZ. Lady Gaga has branded the Russian government's stance towards the lesbian, gay, bisexual and transgender community as "criminal". Sir Bruce Forsyth has been unmasked as an Iron Maiden fan as he attended one of their O2 gigs over the weekend. Labrinth has said he was inspired by Daft Punk when making his new album. Grammy-winning jazz keyboard player and producer George Duke has died at the age of 67, according to a spokesman. Liam Gallagher's band Beady Eye have cancelled a series of shows after guitarist Gem Archer was admitted to hospital with "severe head trauma" after an accident. Kevin Richardson has opened up about what made him leave the Backstreet Boys in 2006. Jason Bateman has revealed that his latest portrayal of Mumford And Sons' Winston Marshall is one of his "proudest" moments.